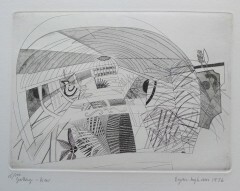 Bryan Ingham, Original Prints and art books with free delivery. Bryan Ingham was born in Preston, and studied first at St Martin’s School of Art in the 1950s, then at the RCA in the early sixties. He travelled extensively in Italy and completed his training at the British Academy in Rome. Ingham then moved to Cornwall and became inextricably linked with the St Ives School of painters. He became greatly influenced by Ben Nicholson, whilst retaining his European influences, above all Picasso and Juan Gris. Synthetic Cubism became increasingly important in his exploration of painterly space: he made relief paintings, and experimented frequently with collage; his constant devotion to the medium of etching was in some ways a logical extension of his explorations of painterly space. He was always a distinctly contemporary artist, being compared to Schwitters and Rauschenberg. He lived in an isolated cottage on the Lizard Peninsula, where the untamed beauty of the landscape became a constant source of inspiration. Though in some ways isolationist, he was a prominent teacher in St Ives, and his mastery of etching meant he was much in demand. He also continued to travel widely in Europe, living at one stage in Germany. His work is held in numerous public and private collections, including the Ashmolean and the V&A. There was a major retrospective of his work at the Fine Art Society in 2006.